Raymelle Moody Guthrie, right, serves a collard green-wrapped hot dog Friday to a customer at her new downtown business, The Moody Dog. A top seller from the new business The Moody Dog is the classic dog, served here with house-made spicy stout mustard and Morse's sauerkraut. 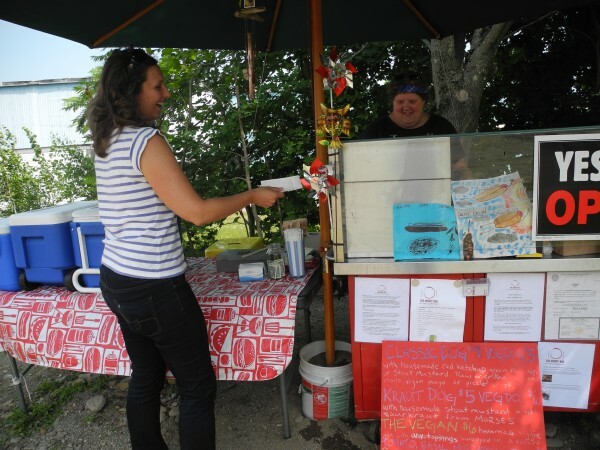 BELFAST, Maine — Raymelle Moody Guthrie is hoping the dog days of summer are here — finally. The Belfast woman’s brand-new business, The Moody Dog, opened in June in the parking lot of the Ocean House on Cross Street. So far, she and her elaborate hot-dog cart set-up have weathered torrential rainstorms, Hurricane Arthur and not one but two construction projects. But customers were lining up on Friday to purchase her grilled hot dogs and homemade condiments, and she was still smiling despite the early summer hiccups. So far, those terms have been tasty, according to the repeat customers who deliberated the pros and cons of slathering green heirloom tomato ketchup, fire-roasted chipotle ketchup or purple tomatillo habanero ketchup on their dogs. And that was just one of many crucial decisions to make when ordering — including whether or not to have a second hot dog. In addition to standard hot dog fare, the Moody Dog offers a changing array of house specials. 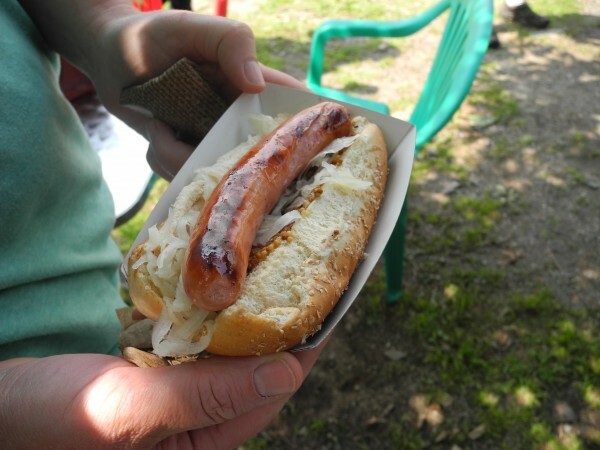 Lately, those have included a tomato-basil mozzarella dog, an “American as apple pie” dog slathered with homemade apple butter and a kimchi dog topped with the spicy cabbage slaw. Caitlin Hunter of Appleton Creamery stopped by the stand on her way home from the weekly Belfast Farmer’s Market. She said she had come by the week before, too. Moody Guthrie said she was partially inspired to go into business by the success of the Good ’n’ You Mexican food truck that has been parked at 39 Main St. for three summers now. She knew that she could find quality meats locally — she has been going through about 150 beef-and-pork dogs a week from Maine Family Farms in Portland. She also uses nearby farms for produce and makes her own veggie and garbanzo bean dogs, some of which end up in the sushi-style Monroe Surf Co. dogs, wrapped in rice and nori and served with wasabi, pickled ginger and tamari. “It definitely seems like it’s the up-and-coming thing around here — to be part of an outside food establishment while still maintaining the quality of local food,” she said. But instead of a truck, she has a cart she found on Craigslist, shadowed by a huge umbrella. On really rainy days she has to close, she said. And sometimes the Cross Street rebuilding project happening a stone’s throw away makes getting to the cart a logistical puzzle for her clientele. She has used her business Facebook page to let people know how to navigate the construction zones and also what’s on the grill that day. But for this summer, the beeping and roar of heavy equipment has kept time with the sizzling of hot dogs on the charcoal grill next to the cart. But the new entrepreneur said she has tried to stay philosophical. The Moody Dog at 2 Cross St. is open for lunch from 11 a.m. to 2 p.m. Monday through Friday. For information, call 930-0862.